The Brussels and Paris terror attacks are interrelated. This article first published on November 9, 2015 in the immediate wake of the Paris attacks is of relevance in analyzing the nature of both the Paris and Brussels events. 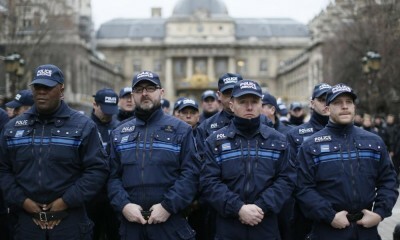 As France finds itself in the grips of martial law and its first mandatory curfew since it was occupied by Germany during world War II, there exists a number of questionable details surrounding the recent terrorist attacks in Paris. 7.) Drills – One hallmark of the false flag operation is the running of drills shortly before or during the actual attack. Many times, these drills will involve the actual sequence of events that takes place during the real life attack . These drills have been present on large scale false flags such as 9/11 as well as smaller scale attacks like the Aurora shooting.For instance, as Webster Tarpley documents in his book 9/11 Synthetic Terror: Made In USA, at least 46 drills were underway in the months leading up to 9/11 and on the morning of the attack. These 46 drills were all directly related to the events which took place on 9/11 in some way or other. Likewise, the 7/7 bombings in London were running drills of exactly the same scenario that was occurring at exactly the same times and locations. 9.) Who controls ISIS? For many, claims that the attackers belong to ISIS is a deal breaker. For these individuals, ISIS is a shadowy terrorist organization that supports itself and has created a caliphate in eastern Syria and western Iraq that can scarcely be defeated (except when the Russians bomb it). However, the facts do not support such a shallow understanding of the ISIS terrorist organization. ISIS was entirely created, funded and directed by the United States, Britain, France and other NATO countries. Its actions have been coordinated by the Anglo-American Intelligence apparatus for geopolitical purposes all across the world both at home and abroad. For this reason, the declaration that ISIS committed a terrorist attack in Paris is by no means a get-out-of-jail-free card for the Western Intelligence apparatus. Instead, it is the trademark of their handiwork. Please see these articles for more information on the nature of ISIS: here, here,here and here. Brandon Turbeville – article archive here – is an author out of Florence, South Carolina. He has a Bachelor’s Degree from Francis Marion University and is the author of six books, Codex Alimentarius — The End of Health Freedom, 7 Real Conspiracies, Five Sense Solutions andDispatches From a Dissident, volume 1 andvolume 2, The Road to Damascus: The Anglo-American Assault on Syria, and The Difference it Makes: 36 Reasons Why Hillary Clinton Should Never Be President. Turbeville has published over 500 articles dealing on a wide variety of subjects including health, economics, government corruption, and civil liberties. Brandon Turbeville’s podcast Truth on The Tracks can be found every Monday night 9 pm EST atUCYTV. He is available for radio and TV interviews. Please contact activistpost (at) gmail.com.